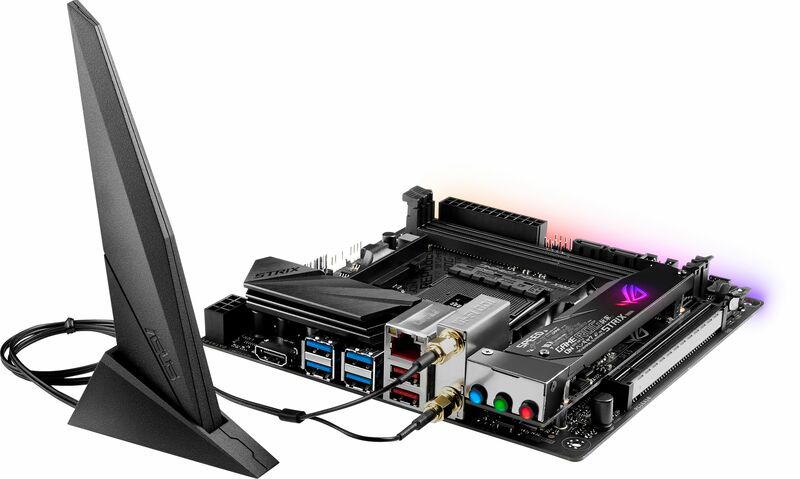 Features a HDMI 2.0 port for 4K support, 2x M.2 ports, 6x USB 3.1, ASUS Aura and Wifi/Bluetooth, making the X470-I the perfect mini-ITX motherboard for a media or gaming PC. 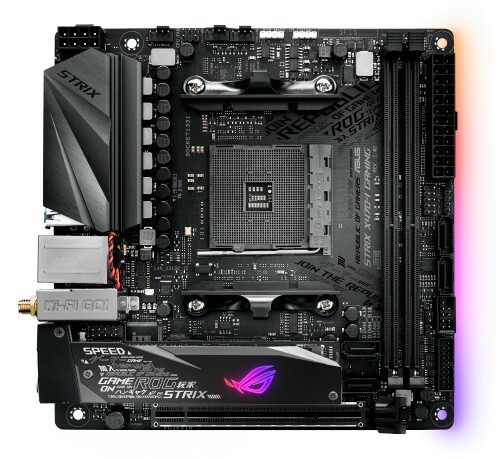 Elevating SSD cooling and premium sound lets the ROG Strix X470-I Gaming transcend Mini-ITX. Infused with all the essential ROG engineering ready for you to create a gaming rig that rivals anything built around a bigger board. Push performance to the limits with 5-Way optimisation and up the aesthetic ante with Aura Sync illumination. 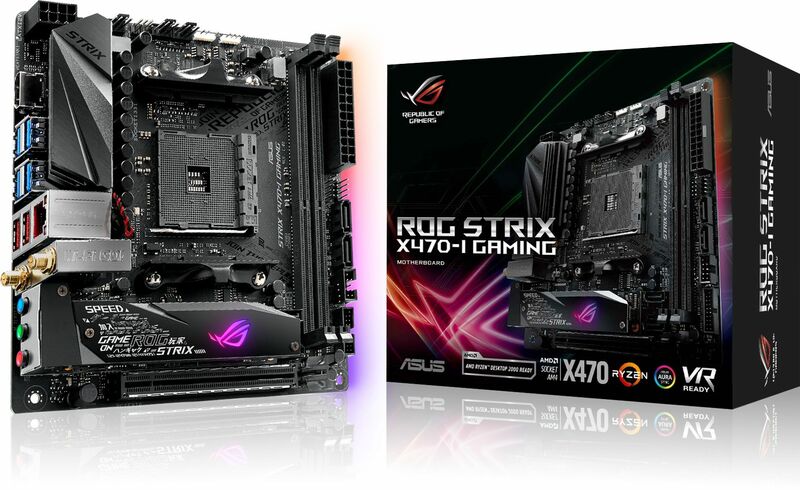 Go compact without compromise with ROG Strix X470-I Gaming and dominate your game! 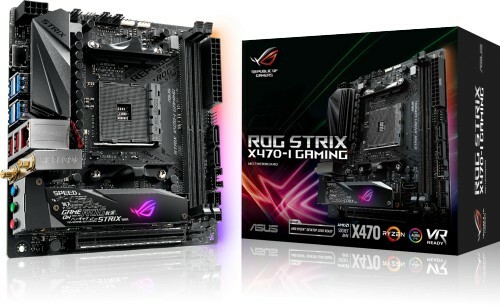 The ASUS ROG Strix X470-I Gaming has a single HDMI 2.0b port, which means when paired with a 2nd gen Ryzen CPU it is able to output a resolution of 4096 x 2160 while running at 60Hz for flicker free images. This makes the X470-I and the 2nd Gen Ryzen CPU the perfect match if you are looking to drive a 4K TV. Just make sure the 2nd gen Ryzen CPU is equipped with Radeon Vega Graphics for immersive visuals. ROG Strix X470-I Gaming features an innovative riser card to help alleviate the constraints imposed by the mini-ITX form factor. The M.2 Audio Combo Card frees up prised real estate by raising M.2 drives and SupremeFX audio circuitry above the mainboard to minimise lateral signal interference. And it's neatly covered by a stylish heatsink that's capable of keeping the latest high-performance SSDs cool. Experience great performance through comprehensive cooling controls, fast storage, and exclusive technologies that enhance memory reliability and speed. Strategic placement of components and optimised trace pathways allow the Strix X470-I to achieve memory frequencies that drive AMD Ryzen performance to the redline. Capable of packing up to 32GB of high-speed memory, the X470-I can tackle complex workloads or supply the bandwidth needed for smooth gameplay. Built-in gaming audio means you're ready to play, chat, stream or kick back with videos — right out of the gate. And included smart routing technology allows you to direct various audio streams to different devices. Up your aesthetic horizons with a new cyber-text design and Aura illumination — to create a personalised gaming with immersion that extends from the inside out.